We praise the Lord we were able to pick up our Visas this past Friday! I especially want to thank Mike Burgett and Russ Stanford for their help with the paperwork! Mike and Russ are the veteran missionaries that I will be working with in Japan while in language school. Bro. Mike wrote a letter of guarantee for us and other letters that were essential for us to be able to get our Visas. Because of their help I was able to get the Visas quickly. Which is a big deal because we are leaving in 58 days!!! 1. Rent for 6 months: $12,000 $5050 total Donated – $6,950 remaining. Apartments in Japan require 6 months to be paid up front. Thursday – Applied for Visas – Need one more letter from Japan. Will try again once that letter arrives from Japan! Now at 91% of our Support! 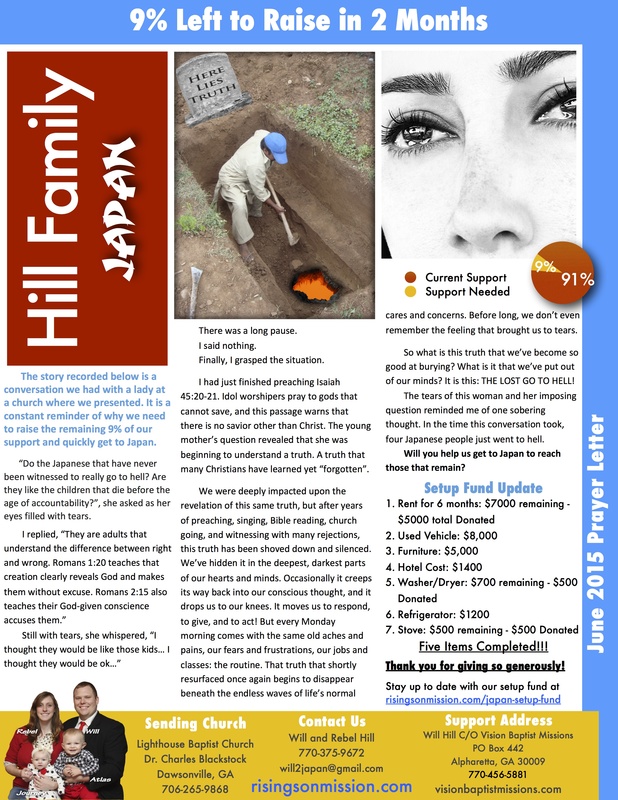 Check above prayer letter or click here.